It's A Dare, A Threat And A Promise. The Magna shares the designation of "power cruiser" with its V-4 Sportbike derived engine dropped into a chassis designed to cruise. Early on, Honda's first generation of the Magna was offered in several versions including; the V-30 500cc, the V-45 700/750cc, and the V-65 1100cc cruiser platform. The first makeover brought great looks, with stylish side panels, a solid rear wheel, and upswept pipes to equal that of the performance output. The Super Magna was born. The third generation presented the Magna in an entirely new make-over. This included a new long, low cruiser chassis to go with an updated re-engineered powerplant. This is not your ordinary cruiser, it is a performer! 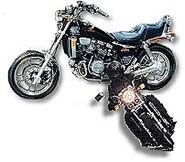 Motorcycle press has given the Magna the title of "Best Middle Weight Cruiser". If you want proof, take the Magna for a long ride into the sunset or tackle that s-curve. 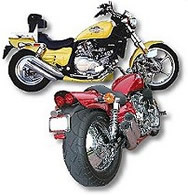 This website is dedicated to those who own a V-4 Honda Magna...past, present and future.